I have to admit I’ve gotten lazy about cooking beans. Part of the trouble with cooking beans from scratch is all that washing, soaking, discarding of water and cooking involved. Mine usually boil over on the stove as well, making an atrocious mess. Add to this that they are easily available and cheap to buy in cans these days, it is easy to see why I stopped. 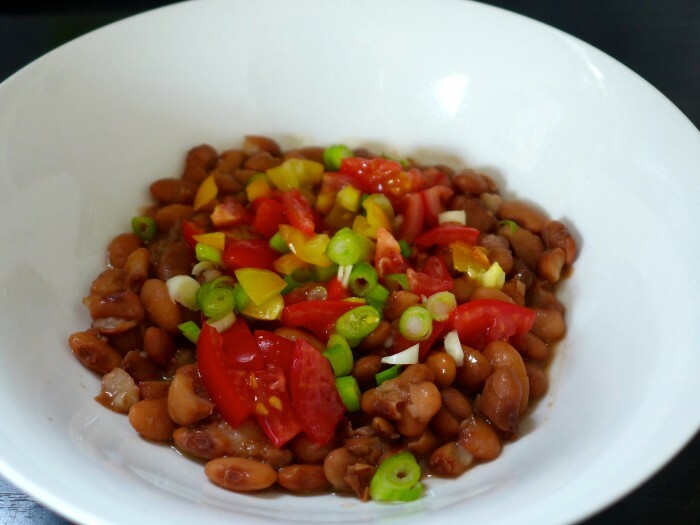 So when I came across a shared post from the LA Times on the Where’s the Beef Facebook page about cooking beans without soaking, I was intrigued. I had also just bought a set of lovely new 600ml round ceramic dishes with lids, so I gave them their first road test by cooking some beans. I made two kinds, some borlotti beans and some cannellini beans. I gave the beans a quick rinse, put them in their dishes, covered them with boiling water, added a small amount of salt and then cooked them slowly in the oven until they were tender. I’ve cooked them a couple of ways, at a constant 150 deg C for a longer time, as well as in the oven with other dishes at a higher temperature for an hour, then turned the oven off and left the beans in to cook on stored heat. Both ways have worked brilliantly. Frankly, they are a revelation. They are definitely the best beans I’ve eaten in a long time. They taste really, really good, the texture is beautiful, and unlike canned ones they taste more of the bean than salt. I ate my first batch while they were still warm with some chopped fresh tomato from the garden, some spring onion and a drizzle of olive oil and a squeeze of lemon. But to be honest they are pretty damn delicious, just straight out of the pot. I’ve also eaten them with some mashed roasted tomatoes or roasted red pepper relish folded through as instant baked beans on toast for breakfast. Since my first batch I’ve made them another three times using borlottis, a four bean mix and chick peas. They are so easy. Fresh from this success, I’m even going to give ful medames another go. I ate some in Sydney at Cafe Shenkin, but my last attempt to create them was a dismal failure. They were still hard after much cooking on the stovetop. There’s still room for canned beans for the emergency meal, but cooking them like this is likely to become a regular event for me. Put into the oven and cook until tender. Check every 30 minutes to make sure there is enough liquid and give them a stir. The beans can take between 1½ - 2 hrs to cook depending on a number of factors such as the type of bean and how long they have been stored. They can also be started at a higher temperature with other things in the oven and then the temp lowered or the oven turned off and the beans left to continue cooking on stored heat. really interesting, I’ve never cooked beans from scratch in the oven so definitely keen to give these a go! Cate they are just great. I’m a bit obsessed with them. 🙂 I’ve eaten so many beans since I started cooking them this way. They’re easy and I often piggy back them onto something else that is cooking in the oven. Yay, great to get local confirmation that this approach works! I’m really pleased with them. I throw a small casserole dish of them into the oven every time I have it on. I’ve eaten so many more beans since discovering the recipe, so I am glad you found it.